Yesterday evening the lead singer of the band Roxette, Marie Fredriksson, turned 53. The same evening the band held a concert in Bucharest, Romania. Thousands of fans sang her Happy Birthday and covered her in flowers. On May 30, the ‘80s favorite Swedish band was on tour and was covering the Eastern Europe area. This was a special day in singer Marie Fredriksson’s life, as she was turning 53. The fans were ready to greet her. They had flowers, toys and a beautiful Happy Birthday song that they sang not once or twice, but three times to the one that sang back to them the songs of their childhood or teenage years. She was deeply touched by the attention and devotion of the fans. The band had an outstanding performance, despite the difficulties that Marie had in the last decade. Nine years ago, in 2001 she was diagnosed with brain tumor, which turned her professional and personal life upside down at that time. She went through several tests and treatments and finally in the fall of 2002 she underwent a tumor removal surgery. And even though the operation was proven a success, it took her years to get back on stage. Now, we see her a bit more conservative, a bit more careful with herself, but still able to send the same powerful message through the songs. Her singing partner, Per Gessle, was the entertainer of the show, running up and down the stage, making jokes, playing duos with the other guitar players and assuring Marie’s back, just in case. 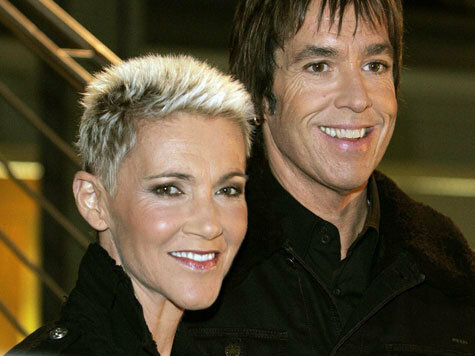 Roxette is now touring for the second time after Marie’s recovery. The first tour was in 2010. At that time the mini-tour in Europe has proven to be a success, which led to the project of another tour, a wider one, that would begin in March 2011. And it did. The world tour was an occasion of promoting the new Roxette album, “Charm School”. Roxette debuted with the single “Neverending Love” in 1986, which was a big hit. One of their best known songs is “It Must Have Been Love” which was part of the soundtrack of the movie that made Julia Roberts famous, “Pretty Woman”. She’s still the most beautiful !!!!! The tumor was found in 2002 and Roxette made comeback already 2009, when they played wirh other artists in Night of The Proms tour, in which rock and pop music is played with classical orchestra.